Have you been looking to save money on a hybrid car? Why not visit our Mechanicstown-area used car dealer and check out our selection of used Honda Civic Hybrid vehicles. You might expect us to only offer brand new Honda models here at Middletown Honda, but when it comes to cars, we want to give you the best options. That’s why we carry a wide range of used cars, including vehicles like the Honda Civic Hybrid. But the Hybrid has changed a bit over the years depending on the generation of the Civic, so we have a bit of an overview of what you can expect. The recent model years of the Civic have had some pretty substantial changes, including powertrain updates to both the basic and hybrid models. The fact is even within a generation, there can be a lot of differences, so we encourage you to treat each Civic Hybrid on its own to see if it fits your needs. That said we have some highlights that should give you an idea of where you should look in the history of the Civic Hybrid. Although the 2014 Honda Civic Hybrid has been getting some special attention, it will likely be a bit before it’s available in our used car inventory. 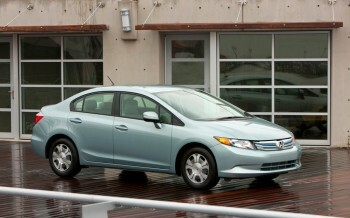 On the other hand, the eighth-generation Honda Civic had a hybrid powertrain available too, all the way up until 2011. Its 1.3L four-cylinder engine was paired with an electric motor that gave it as much as 110 hp, and it was paired with a continuously variable transmission, resulting in an EPA-estimated 45 mpg highway fuel economy. Later years, including the 2012, 2013, and 2014 models, had slight powertrain adjustments made, but regardless, they were still the most fuel efficient Civic released in their model year. Features on the Civic Hybrid have always been pretty impressive, and you can find many modern amenities on a used model, including features like automatic climate control, sport seating, heated seats, and Bluetooth connectivity. We think that there’s a Honda Civic for nearly every driver, and if you’re looking for a used Honda Civic Hybrid, we want to help you find it. Contact our dealership today to see if we have your new-to-you hybrid, or visit us at 520 Route 211 East in Middletown.